The gentle mix of vanilla and butterscotch gently kiss and arouse olfactory memories, taking me back to spring days in western forests where the sun’s returning strength would coax that sensuous smell from exposed bark. I currently live where there are few trees and my soul often aches for them as if I had lost a lover. 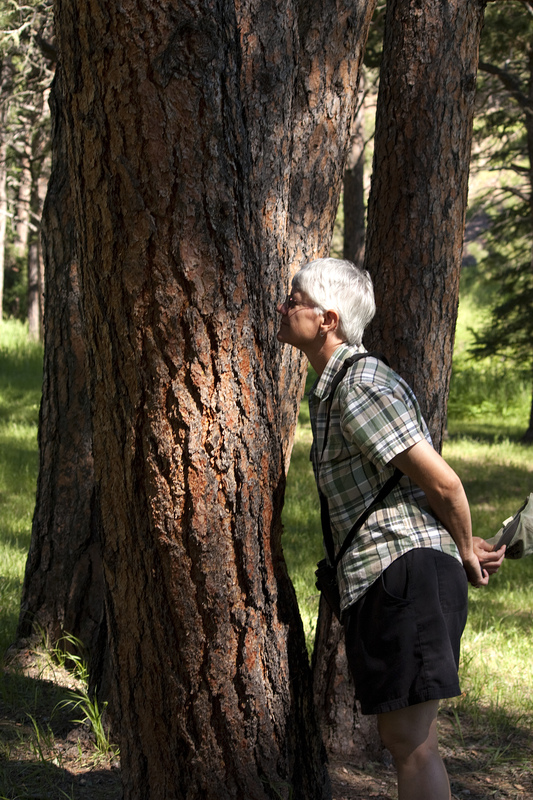 Although it appears I may be kissing this Ponderosa Pine, I am not…but…I could, I could. Beautifully written. I shudder at the thought of living anywhere there are few trees. Fortunately I’m blessed with being able to walk out my front door and into the woods. I know, it’s kind of hard to imagine isn’t it Jeff? The prairies have a unique beauty which I certainly appreciate but I think we have an innate environment where we feel more “at home” and trees certainly decorate MY home! You have a lovely blog Maya! Thanks for visiting my journey, it means a lot! I will be on the look out for your next post!